Chef Emily Doerman not only studied at the International Center for Culinary Arts in Dubai, she is also a registered dietician who works in an internal medicine practice. You can always find her at the farmer’s market in Great Falls, Virginia, on Saturday mornings doing cooking demos with fresh ingredients. Preheat the oven to 375⁰. Wash and trim off the ends of the eggplant. Create a striped eggplant look — use a peeler and peel off skin in one-inch strips alternating with one-inch strips of eggplant skin lengthwise. Next, cut eggplant crosswise into one-half- inch round slices until you have 8 slices. Lay slices on a plate and salt both sides. Let stand for 10 minutes. With a dry paper towel, wipe off salt and pat dry. 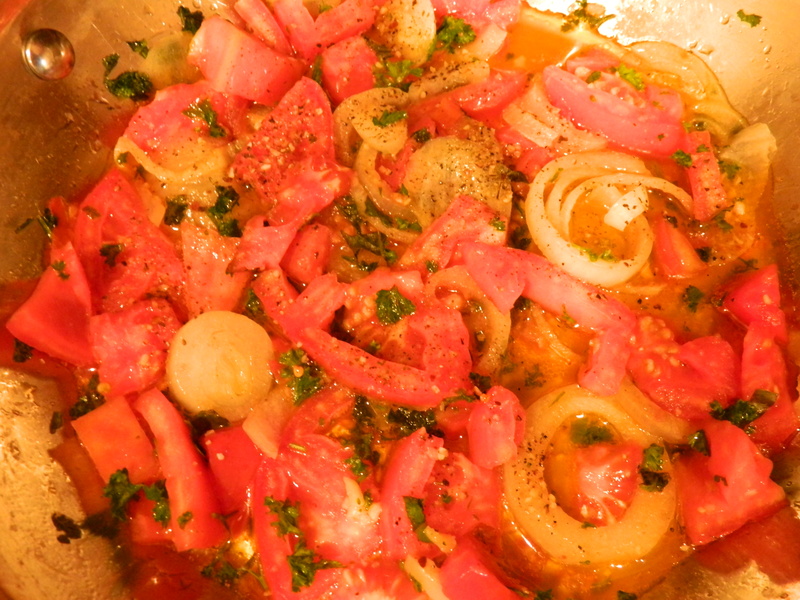 Cut the tomatoes crosswise into one-half- inch slices. To chiffonade the basil leaves, make a stack of 6 to 8 leaves at a time. Tightly roll leaves. Make very small slices crosswise into the roll. Mix cut basil with vinegar and a pinch of salt and pepper. Set aside. Prepare a baking sheet with nonstick cooking spray or oil. To layer the eggplant caprese salad, start with one eggplant slice on the bottom, top with 1 tablespoon balsamic basil mixture, then 1 mozzarella slice, 1 tomato slice, next another slice of mozzarella, 1 slice tomato, 1 tablespoon balsamic basil mixture, and finish with 1 slice eggplant. 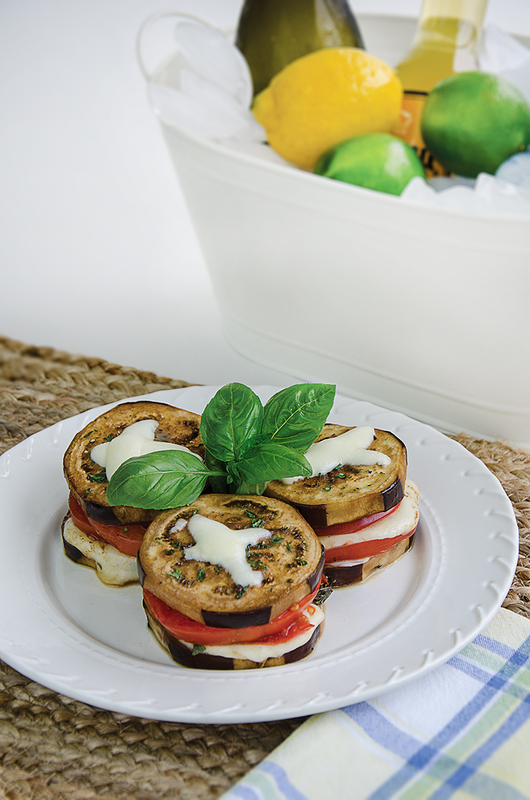 Hint: When layering the salad, make sure the slices of eggplant, mozzarella, and tomato are similar in diameter. Drizzle tops with balsamic vinegar. Repeat this for three more stacks. Use toothpicks to hold in place while baking. Bake 18 – 20 minutes until cheese is melted and eggplant is soft. For garnish, top with small slices of mozzarella and allow to melt. Remove toothpicks before serving.